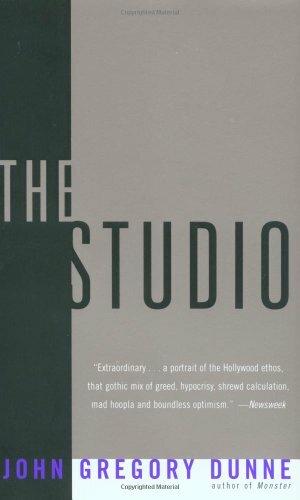 John Gregory Dunne — journalist, novelist, and screenwriter — gives you an intimate, accurate account of Hollywood, offering a riveting expose of life and work in The Studio. Thirty years ago, John Gregory Dunne asked for unlimited access to the inner workings of Twentieth Century Fox. Miraculously, he got it. For one year Dunne went everywhere there was to go and talked to everyone worth talking to in the Fox organization. He tracked every step of the creation of pictures like Dr. Dolittle, Planet of the Apes, and The Boston Strangler. The result is The Studio, a work of reportage that, thirty years later, may still be our most minutely observed and therefore most uproariously funny portrait of the motion picture business. Whether he is recounting a showdown between Fox's studio head and two suave shark-like agents, watching a producer's girlfriend steal a silver plate from a restaurant, or shielding his eyes against the glare of a Hollywood premiere where the guests include a chimp in a white tie and tails, Dunne captures his subject in all its showmanship, savvy, vulgarity, and hype. Not since F. Scott Fitzgerald and Nathanael West has anyone done Hollywood better.